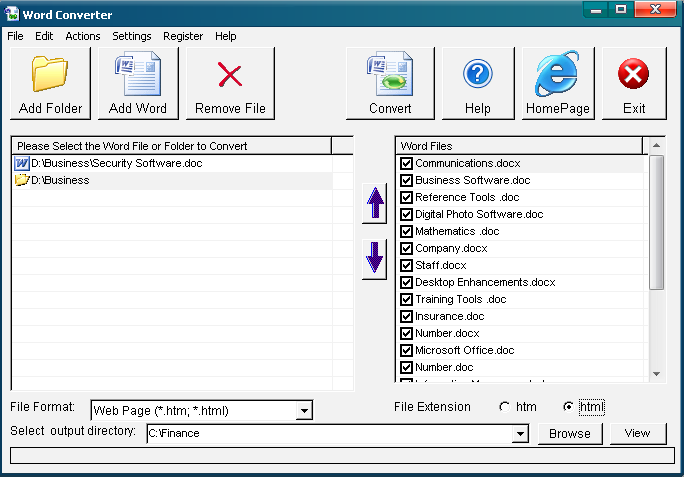 Word Converter software can help you convert Word to HTML, MHT, RTF and TXT in batches. Word Converter can convert a lot of Word files to HTML, MHT, RTF and TXT files , thereby saves your time. Are you still bothered by the cumbersome job of Converting a lot of Word files to other formats such as HTML(*.htm,*.html), MHT(*.mht,*.mhtml) , RTF(*.rtf) and Text(*.txt) ?Word Converter saves your time by doing the chores for you. Microsoft Word 97/2000/XP/2003/2007 or higher. Convert PDF to Word Document DOC, TXT, RTF File. Free Convert PDF to Word Document DOC, TXT, RTF File. Qweas is providing links to Word Converter 2009.9.9 as a courtesy, and makes no representations regarding Word Converter or any other applications or any information related thereto. Any questions, complaints or claims regarding this application Word Converter 2009.9.9 must be directed to the appropriate software vendor. You may click the publisher link of Word Converter on the top of this page to get more details about the vendor.